Honda came to India in 1998 and became an instant hit with the upper crust of the Indian middle class with the Honda City. When everyone else was driving around in carbureted Maruti Esteems with negligible features, Honda offered the likes of the electronic rear view mirror adjustment. And in the last 18 years of existence, the Honda City has been at the top of its game as one of the most favored cars in India (I should know… I have owned several). Sadly, Honda’s other cars have never enjoyed sales or ‘love’ like the City has. Fast forward to now – 2016. The SUV is clearly king of the Indian automotive segment. And until very recently, Honda did not have an affordable SUV which came with a ‘must-have’ diesel engine. Now they do. After years of dilly-dallying around with prospective products, Honda India finally has a compact SUV to offer in India. And it is the brand new Honda BR-V. View offers on Honda Cars from Honda dealers in Mumbai at Autozhop. The Honda BR-V isn’t your classic, butch SUV but it has an imposing stance nonetheless. Undoubtedly, the best angle on this machine is the CR-V inspired face with handsome wraparound headlamps that house a projector low beam and LED daytime lamps. The sculpted front bumper adds a dash of aggression without looking overdone and the silver treatment for the faux skidplate looks premium. Front on, the Honda BR-V looks both capable and expensive and will definitely turn heads. The view from the side however reminds of the BR-V’s sibling the Honda Mobilio. From here, it looks more MPV-like with a long windowline that has a pinched end, another CR-V theme. There are some points of interest like the kink in the windowline, creases in the bodywork and funky looking 16-inch wheels that reside within rugged looking, black plastic clad wheel arches. The MPV impression is reinforced by the long rear overhang which allows the accommodation of the third row of seats. If the Honda BR-V had a shorter, more abrupt rear overhang, it would have probably looked at lot more ‘SUV’. Still, the high ground clearance and roof rails attempt to inject some of that back into the design. A smartly executed rear end uses a couple of wraparound LED lamps that are connected by a reflective strip. The rear windscreen is large and offers good visibility. The Honda’s City’s interiors are one of the sedan’s USPs, and Honda has decided to continue with the trend, offering a familiar layout in the cabin. The all-black layout offers a sporty and classy touch, though some buyers may prefer a beige palette. The piano-black centre console and dull silver accents across the cabin add a premium touch, with subtlety.While the exterior of the BR-V does emit a Mobilio-esque vibe, the interiors don’t share the MPV’s relatively cheap look and finish, though there is room for improvement, especially considering the competition it faces. The top-spec version gets good-quality leather upholstery with leather around the steering wheel, gear knob and door armrest as well. You also get adjustable headrests for all seven seats. Honda’s “man maximum machine minimum” philosophy has given its cars a good reputation when it comes to space, to the extent that hatchbacks like the Jazz offer space that can put sedans in segments above it to shame. All three rows of the BR-V are very accommodating and can hold the average Indian frame in reasonable comfort, even if the person is on the bulkier side. Space in the second row is generous enough to accommodate one six-footer behind another. The seat compound isn’t very soft and, while it will help on long-distance highway trips, short in-city journeys could prove to be a little irritating. The BR-V does make a good proposition for a large family and will satiate most needs, but ignores many of the buyer’s greeds. The feature is far too spartan and, while you do get keyless entry and go, and automatic climate control with roof-mounted rear AC vents, these features aren’t differentiators. The music system would barely be acceptable in a Brio, let alone the BR-V. Additionally, the 4.4-metre length should immediately warrant the inclusion of parking sensors at least, if not a rear-view camera; not to mention, you get just one 12V charging socket (for the front passengers) in a car that has three seat rows. As we mentioned earlier, the Honda BR-V comes with a diesel engine. And of course, like with all other compact SUVs in the market today, a petrol engine too. Both are 1.5-litre units that get a 6-speed manual gearbox (with the petrol also getting a CVT gearbox and paddle shifters). The diesel is a turbocharged four-cylinder unit makes 100PS of peak power and 200Nm of peak torque. The petrol is also a 4-cylinder i-VTEC four-cylinder unit that makes 119PS of peak power and 145Nm of peak torque. We first got a chance to drive the petrol engine in both its manual and automatic avatars. As always, the 1.5-litre motor is revvy and sounds glorious when taken all the way to the red-line. Of course, power bands are quite linear but there is a bit of a lag at the lower end of the rev-range. The new 6-speed gearbox is as good as the old 5-speed and has short and very precise shifts along with a good clutch action which makes it ideal for start-stop city traffic. However, if you are a city slicker and like me spend about three hours a day stuck in traffic, then you have to consider the CVT gearbox.And as with the Honda City, the CVT on this car also gets a paddle shifter option. Now, in general ‘Drive’ mode, the CVT behaves like any other whiney CVT out there. But push it into ‘Sport’ and you can go through gears with the paddles giving yourself a very Jenson Button-ish feel. Of course, everyone is going to be most concerned about the diesel engine and the tried and tested 1.5-litre engine is most certainly going to loose all games of ‘Top Trumps’ when compared to its rivals on the basis of power and torque figures. But the Indian customer is more than these power numbers – the Indian customer is all about the fuel economy number. And in that aspect, the BR-V does score high with a figure of over 21kmpl (according to ARAI). On the whole, yes, the diesel does feel a bit laggy when it comes to punch, but once you get it going, it pretty much holds its own. The NVH levels though have definitely improved with Honda putting in a lot more effort to dampen heavy acceleration noise and general roughness. Sadly, Honda has no plans for an automatic variant of the BR-V, which we think would have done extremely well in the present market circumstances. Honda’s surveys indicated that 65 per cent of buyers valued a comfortable ride quality and that’s exactly the way the Honda BR-V has been set up. The car doesn’t feel overtly soft or squishy but absorbs bumps and irregularities well.The suspension feel is similar to a Honda City, placing ride comfort over sporty handling. The electrically assisted power steering is well weighted and not as light as the Hyundai Creta. The driving position, while comfortable, isn’t very high up and commanding. From behind the wheel, it feels more urban crossover than a full on SUV. Grip levels from the Michelin Primacy tyres are good and the Honda BR-V feels perfectly adept on a winding road but not really involving or exciting. 210mm of ground clearance is the highest in the class and allows stress free driving on the worst of broken roads. Highway stability is good and the Honda BR-V is happy at a steady 120kmph without feeling light or flighty. Harsh NVH has been a Honda weak point for a while on this platform and the company has worked hard to fix that. While the engine is still quite vocal, road noise has been significantly reduced thanks to extra insulating materials used in the doors, hood, roof, floor and dashboard. The cabin in the CVT petrol was quite silent and well insulated. The BR-V feels far more isolated than its Brio-based siblings and is up in the realm of the Honda City. 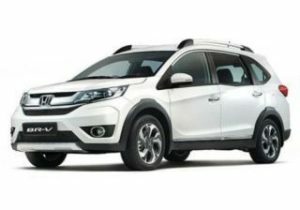 Apply car loan for Honda BR V at Fincarz. The BRV is at par with the competition in terms of safety. The BRV scored 5 stars in the Adult Occupant Protection (AOP) and 4 stars in the Child Occupant Protection (COP) tests conducted by the New Car Assessment Programme for Southeast Asian Countries (ASEAN NCAP). In terms of safety features, the car gets dual front airbags as standard while ABS is available in all the variants except the base trim.Other safety features that are spread across the variants include a driver seatbelt reminder, security alarm and impact sensing door unlock. Honda Brv On-Road Price in Ahmedabad ranges from 9,73,597 to 14,32,240 for variants BRV E Petrol and BRV VX Diesel respectively. Honda Brv is available in 9 variants and 6 colours. Below are details of Honda Brv variants price in Ahmedabad. Check for Honda BRV price in Ahmedabad at Carzprice. And those things are not the fact that the BR-V looks a little too much like a MPV (particularly the Mobilio from the side), or the fact that in terms of power (on paper) it isn’t up there with the best. And even though this ideal customer would have loved the seven seater layout and the sheer amount of space that the BR-V brings, this same customer also wants a gadget rich option. And the BR-V is nowhere even remotely close. Does the BR-V still have the potential to move the Indian market like every Honda City has ever done? Yes, but if and only if Honda prices the BR-V extremely aggressively and takes a cut on their profits in order to get the units out of the showroom floors and onto the streets!